You cannot write anything from sewing to coding on your business blog. Your web content needs a strategy that aligns with your customer’s goals. Your blog needs a plan that builds the content network to establish authority in your industry. It needs content mapping to build that network. Before I explain industry authority to you, you need to know who you are writing for and what you aim to achieve writing for your audience. Let me give you an example, I aim to create simple guides that help aspiring writers or online business owners learn to write effective web content. What do I do for them? ► I help them write web copy and content. ► I help them write content that elevates their goals. ►I belong to the writing/blogging industry. You can also call it the content industry. How do you stand out in a competitive industry like this? ► By holding the ropes of authority. You have to create content that showcases your expertise. If you are a website designer, your blog should display arrays of articles that solve website woes. For example, you may write posts on installing Google Analytics plugin, fixing the dangling hero on the homepage or enabling clean margin spaces on a web page etc. By doing this, you are establishing industry authority. This tells your audience that you know your work inside out. Your audience will trust you to solve their problems because they have seen you doing that. If you are a web design expert and if you write about your favorite pet or your favorite travel destination, it is not going to work. Establishing authority can help you earn a loyal audience who will trust your work. In short, Content Strategy is the master plan behind establishing industry authority through the content on your web. You need to devise a plan that creates a unique content network on your website. A network cannot have broken links. 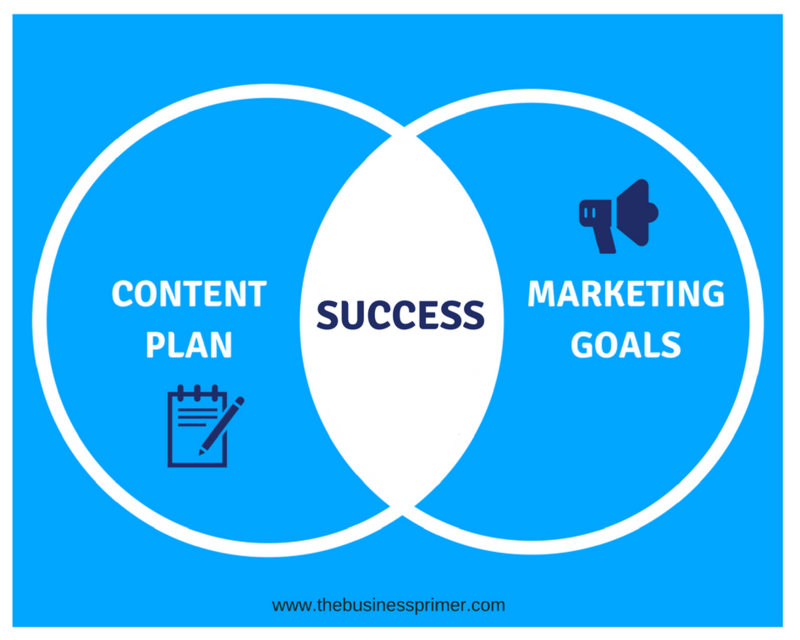 Likewise, your content plan should connect each piece of content to a smaller goal. A collection of smaller goals pointing towards a bigger marketing goal is the purpose of your website hosting a business blog. What are marketing goals and how do you set them? You set goals because we identify the need to prioritize. If you do not prioritize, your business will be as disorganized as an addict’s backpack. Full of stuff, but nothing vital. Setting marketing goals becomes a need when you see shortcomings in building your brand. You see shortcomings when you evaluate your work or abilities. Have you identified your immediate business objectives? Do you have a list of tasks that elevate your business? For freelancers or small businesses, a long to-do list is the biggest productivity killer. The overwhelming list helps you procrastinate and lose the game. Set short goals. Have goals for the day. Beginning this month, a social media manager’s goals could be to get high paying clients. Wrong. That is a redundant goal even though that is the ultimate result every business wants. A social media manager should master the art of persuasion (Of course, not in a day!). She is given a limited word count. And that word count is her only opportunity to persuade as many readers she can to click the link she is posting. So her main goal should be to master persuasive writing. She should know how to make an instant connection with her audience. She should know how to walk her audience and convince them that the link is a valuable resource. So, the workable goal here is to learn PERSUASIVE WRITING. Is this goal helping her meet her marketing needs? Of course, she can make use of the same persuasive methods to tell her prospective clients how good she is in her work. Now do your marketing goals align with your content? Oh yes! How content mapping boosts your business? When you own your reader’s problems and turn them into solutions they need, consistently, it means that your strategy is on the right track. How do you provide solutions? A high-value blog post that gives a step by step plan your reader needs to meet one of his objectives. A workflow that helps one of your readers arrive at a solution. A motivating piece of statistics that will inspire your readers to take action. An infographic diagram that explains the core subject in bite-sized chunks that is easy to consume. You succeed in your content marketing goals only when you bring demand based solutions to your blog. Your readers will not want solutions to problems they do not have or are insignificant to them. Do your market research. What is the best way to know what your customer needs? There is no way you can read your customer’s mind. You are not Edward Cullen. Even if you are, your customers are many a Bellas. They are emotionless when it comes to your pain points even though you are trying to solve their problems. When I started out in marketing and began searching for my ideal client, I would crack my head. How can anybody read their customer’s mind to know what she wants? I would sit for hours taking guesses. It is a stupid thing to do. Why not just ask them? By asking your customers about their problems, you are surely providing solutions to problems that EXIST. I attended a marketing event organized by one of the startup hubs in Hyderabad. Business owners introduced themselves and spoke about how they made dollars and there were some who did not. There was one entrepreneur who invested nearly $25000 in his venture and failed. He crawled into debt. The first question the host asked was, “Did you carry out a market research before you built the product?” and the answer was “NO”. He was confused. He built an app that targeted the education community. But before building the app, he did not ask one person from the education community about the necessity of such a product. Products are not made of ideas. Products are built, reinvented and customized to suits the market’s needs. So, offer solutions that are needed. You will be left bankrupt if you spend your money on unwanted solutions. That is the position of market research in business. Now that you know what the customer wants, aim to build products around their needs. Before you sell your products, build a knowledge base that dissipates bite-sized information that solves your customer’s little problems. How do you release the bite-sized solutions? Through your business blog, email marketing and promoting this content to the world through social media platforms. Although there are other social platforms, your business blog is the major bridge between your customer and your company that emerges as a true brand community. Now, devising your content flow is gathering all the input points that land to one central point of focus. The CTA. It is the CTA that helps you accomplish your goals as a marketer or a small business owner. You can easily call it that tangible element in this virtual world. Is the content leading to CTA compelling enough to catalyze the reader’s action? Has the content brought engagement that builds customer relationships? These are the factors that you need to visit with agility and work till you get there. Content Strategy is not a one-off item on your content marketing checklist. It takes experimentation to beat the odds and focus on the right channel, right method and right type of content that aligns with your goals. The point is, have you set the right goals?